That red and black brooding piece by Siqueros could come up in nightmares ... Magnificent! I'm impressed. I usually am when you post about art. Cool range of stuff there, Grrrl. 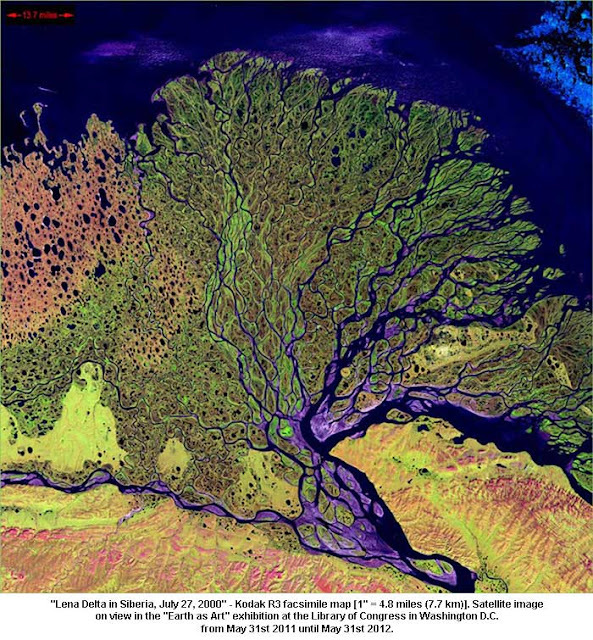 I'm naturally drawn to the Earth photograph, though the others are worth a look as well. That's a cool collection of art. I was quite taken with the aerial photograph of the Lena river delta and I also followed the Andy Warhol article and Tina Modotti links. 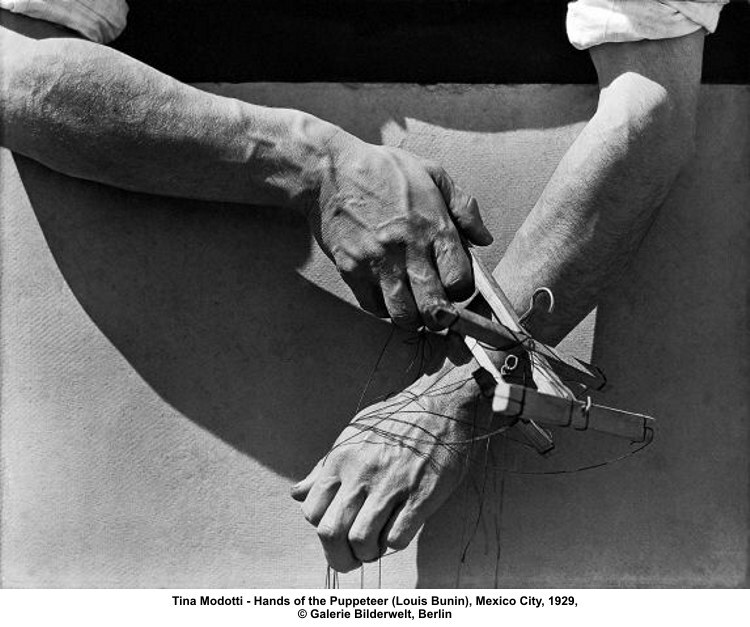 They say the past is another country, but I feel that those Tina Modotti photographs really provide glimpses into a whole 'nother world. Life is much like a river, is it not? Rushing away from her mountain birth in tiny rills and cascades she rejoices in waterfalls and rapids. In maturity she slows growing wide and deep. At last the mighty river tangles herself among a thousand islands of memory on her reluctant approach to the sea. I liked them all but that one stopped me in my tracks. Wow1 Oh wow! Oh wow! What an amazing cache. I love them all - so different - so varied - and each a unique expression. Akseli - I found you through a comment on Francis' blog. Welcome and thanks for topping by! This is amazing. The Wyeths are utterly amazing. Sandy - I was hoping someone would mention the Wyeths. I love the mood of the day he captured in all three. I was oohing and ahhing over each of them ~ long-time Wyeth fan, and I love the puppeteer's hands. 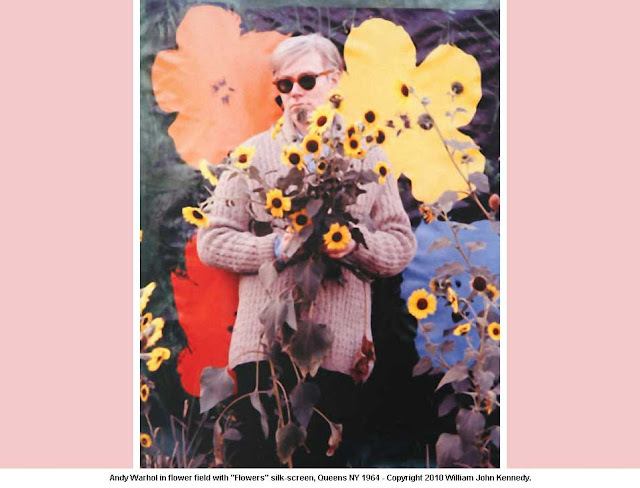 but that Warhol photo? fantastic. a fave. great find Gina. have a great weekend. Gina, these are all so good that it is hard to single out just one for comment. Nice post. Becky - so good to have you back! Jack - glad you enjoyed the post! Everyone - have a great weekend. I have a four-day starting right which I plan on enjoying thoroughly! Okay... I'm going to take just one of these and see if I can describe what it does to me. "The Sweep"
This is a deceptively simple painting. 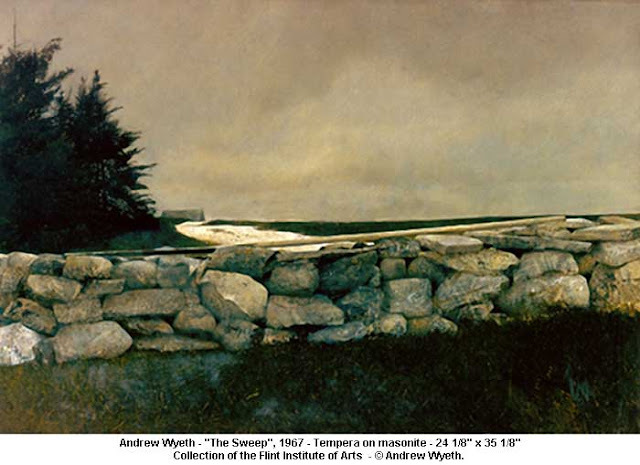 Typical Wyeth, too, in the way so much of it is balanced perfectly, and the way he plucks this set of visual teeter totters out of the craziest slice of the middle of nowhere. It's not so much a painting of a thing or a place as it is a painting of the place AROUND or BETWEEN the things and places. The horizon line just about cuts the painting in half. 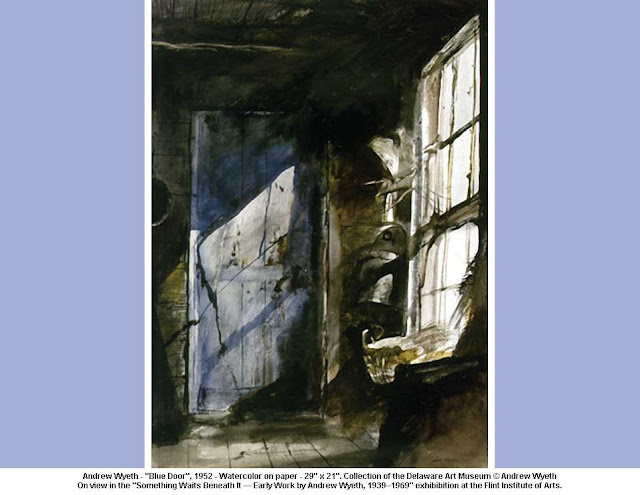 This is generally a no-no, and Wyeth deeply understands this. The half-way line is a sort of "bottom of the visual gravity well" "most obvious and boring spot" for the major dissector of a piece. And that is precisely why it plays such games with the shallow diagonal of the top of the wall, emphasized by the long pole on top, and the way the right hand end curves just a bit above the horizon line. The center line is such a strong pressure that it makes that little distortion on the right, the diagonal, and the ever-so-quiet S-curve of the whole top of the wall, MUCH more important than they would normally be in any other position. And that emphasis of the pole would not be anywhere near as strong without that glimpse of snow under it - which is o-so-nearly-but-not-quite in the middle of the painting - a sort of fulcrum or balancing point for the pole and the painting on the OTHER axis. Tension AND balance in both dimensions. The stones are in the foreground - but somehow they seem to be like little miniature skies, and thus the big sky on top seems closer and more immediate than it otherwise might. It makes the foreground and background tussle with each other, even as everything seems so peaceful due the nearly windowpane like divisions on the surface plane. And just try in your mind's eye changing the shape or placement of the large dark tree silhouette on the left, or the balancing darkness in the lower right. Any change you can picture seems to diminish the painting, or upset the balancing that makes the pole and the top of the wall the REASON for this image. Even the darkest stone in the wall is not an accident, nor can it be moved or changed without loss to the sum of the painting. To me, this is what stands out in Wyeth's work as his particular voice, his particular genius. As much as his colors, textures, and subject matter are his own, for me it is these compositional tensions and balances making the pieces so peaceful and yet on the edge, like the stillness before something spontaneously shifts, or the pent up pressures of centuries, which are his real subjects, his real message. 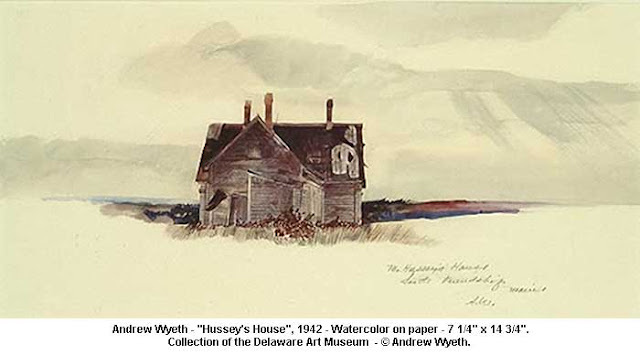 And seeing studies he did prior to paintings provides many hints about the work he did to CREATE, not just find, these glimpses of balance and tension - these pecularily Wyeth compositions. The final painting is often much removed from the initial sketch or concept, and each drawing between brings more harmony and force into the mix, until you have the final statement, which is the most peaceful and more powerful of the series. He WORKED at these - they were't discovered; they were MADE. 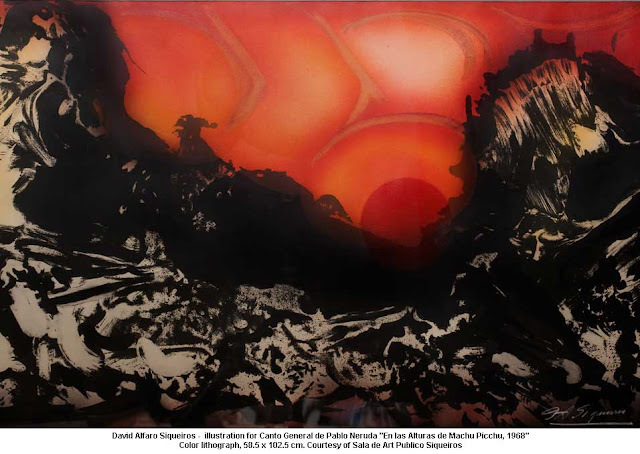 They weren't lying around him - his surroundings offered hints and then the paintings came out of his soul. You can't go looking for Wyeth's paintings in the Branywine Valley of Pennsylvania because they only exist on the paper, canvas, and masonite, the products not of his eyes, but of his inner vision.